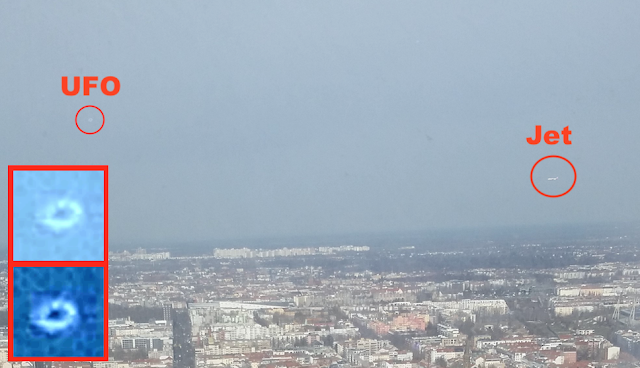 UFO SIGHTINGS DAILY: UFO Over Berlin Airport Moves Out Of Way Of Jet, March 6, 2019, UFO Sighting News. 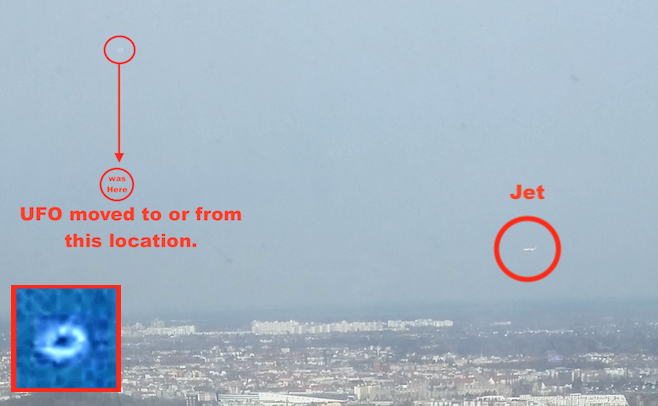 UFO Over Berlin Airport Moves Out Of Way Of Jet, March 6, 2019, UFO Sighting News. Here is an interesting report from MUFON today. A person took some photos and noticed a UFO two of the photos. 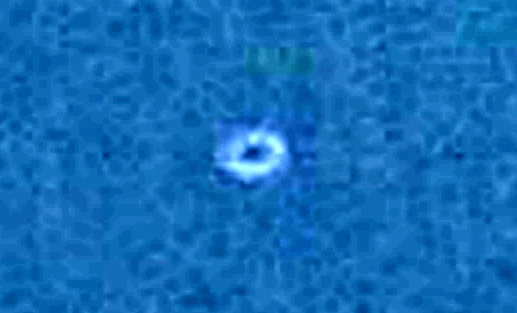 What looks like a ring UFO may be one solid craft with the top center having a dark tinted dome window area on it. The UFO moves it position when it notices the passenger jet approaching it. This makes me think there is a possibility of the UFO having shown up on airport radar. The UFO itself was probably hovering over Berlin Brandenburg Airport for a few minutes before it was forced to move out of the path of a jet. When you compare the size of the jet, lets say for comparisons sake its a 747 which is 76.3 meters long. Then this UFO is 30% the diameter of the jet, making the UFO 22.89 meters across. Notice how the UFO takes on the color of the sky behind it? Its tying to go unnoticed. The ships outer hull reflects the colors around it. A lot of UFOs have been recorded over Airports over the years. I guess anything that flies has the newest and highest tech for safety reasons and that makes it worth investigating by aliens. Round object found in the sky after taking photo from the TV tower in Berlin.